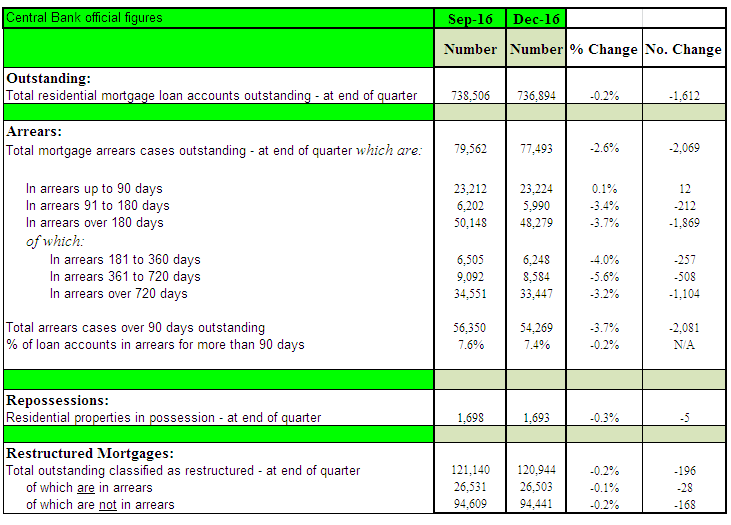 Do we need another category in the mortgage arrears data? Why is “arrears capitalisation” so difficult to understand? The number of legal proceedings issued by banks to repossess homes has halved in the past two years. 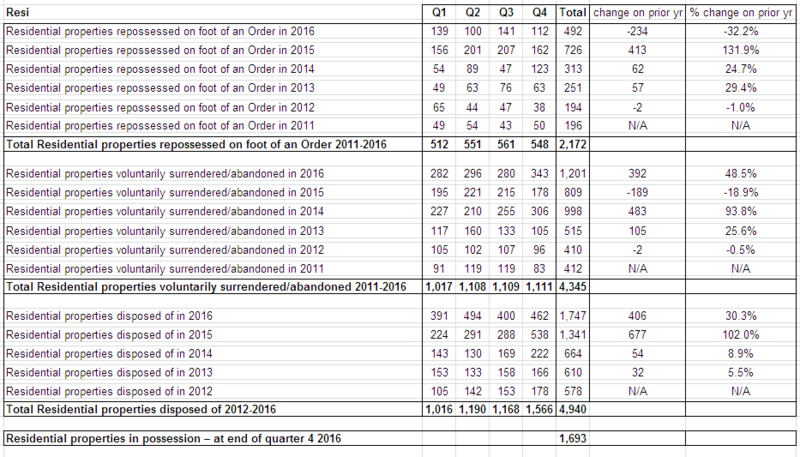 A total of 3,665 proceedings were issued across the country last year, new figures from the Courts Service show. Financial experts said the huge drop in the number of proceedings demonstrated that claims of a flood of repossessions had not materialised. The new figures, seen by the Irish Independent, show that 1,072 orders for possession were granted once the cases were heard. The vast majority of the cases relate to residential homes. But there are also a small number of buy-to-let properties and some classified as “other unknown” in the figures. The small numbers of proceedings issued and the low level of repossession orders granted by circuit courts is in contrast to predictions from some commentators of a rash of repossessions. There was a 20pc fall in the past year in the number of repossession orders granted for family homes compared with the previous year. In contrast, there are around 33,400 residential mortgage accounts in arrears for more than two years. Consumer advocate Brendan Burgess, of the Askaboutmoney.com website, said this meant that last year someone who was more than two years in arrears had only a one-in-20 risk of losing their home. 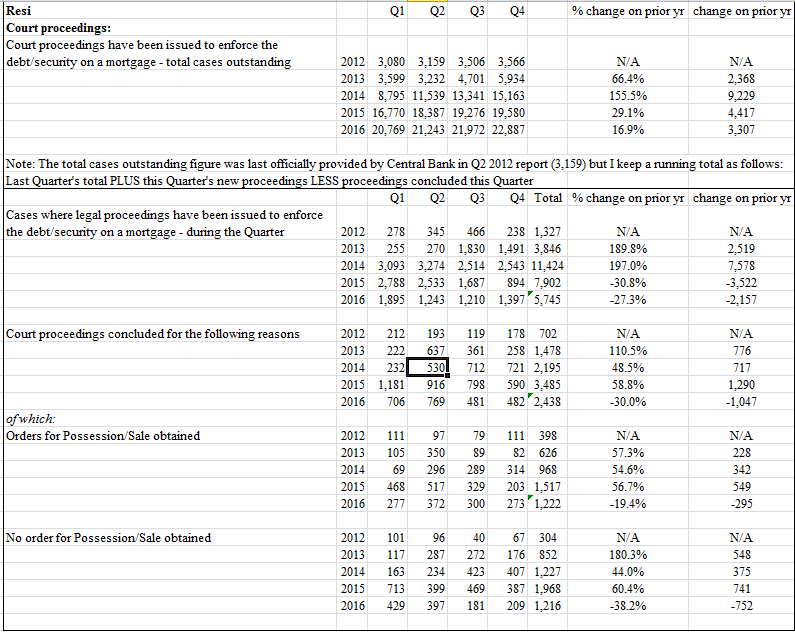 “The figures show a huge drop in proceedings issued. There was never a tsunami. There was not even a high tide. And the tide is quickly receding,” Mr Burgess said. A MOTHER-OF-NINE has secured a temporary High Court injunction halting the sale of her family home. Patricia McLeish told the High Court she has been living in rented accommodation after she and her family had to leave their home at Coolisteigure, Clonlara in Co Clare after it was repossessed by Bank of Ireland. The property, she said, is due to be sold at auction. She said that in ****2004 ****a repossession order was made in respect of her home in favour of BOI by Clare Circuit Court. She claims that after 12 years of postponements the order was not executed until October of last year. a repossession order was made in respect of her home in favour of BOI by Clare Circuit Court. Not quite matching up. Where are they getting their numbers from? A Dublin couple, who reneged on their mortgage repayments just under four years ago, lost their upmarket Castleknock home to “the Governor and Company of the Bank of Ireland” today Wednesday. Judge Jacqueline Linnane in the Circuit Civil Court said in a reserved judgment that Patrick and Angela McMahon had borrowed €960,000 to purchase their family home at 1 Park Lodge, Laurel Lodge, Castleknock. She told barrister Nevin Powell, counsel for the bank, that there was no dispute between the bank and the McMahons that the last instalment made by them was a €200 payment on July 1, 2013. Mr Powell, who appeared with McDowell Purcell Solicitors, had told the court that arrears had risen to €288,577 and the overall debt to the bank was now over €1,380,000. 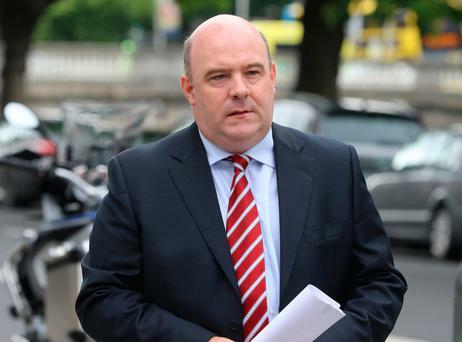 Judge Linnane said Mr and Mrs McMahon had raised a number of issues in their defence against the bank’s possession application, all of which the court rejected. She said the McMahon’s had claimed the bank’s bid to re-possess their home had fallen short because it had failed to note in its evidence what time of day its affidavits had been made and sworn. The defendants had also accused the bank of reckless lending which, the judge said did not exist in law, and alleged that the terms of their mortgage contract had been unfair. She said there was an onus on anyone signing a document to read it before doing so. Judge Linnane said numerous adjournments had been granted to both sides to facilitate progressing their case. The judge said that in her view the bank’s proofs were in order and the defendants had failed to establish any defence to its application for possession of the property. Granting the bank an order for possession the judge said she would give the McMahons a stay of four months on the execution of her order. Costs of the overall proceedings were awarded against the McMahons who said they intended to appeal against the judgment to the High Court. Some Freeman antics in this one by the looks of it. It looks like about 7 years or so of arrears in total though. SBP lead story today is that AIB poised to sell thousands of distressed mortgages. You’ve got to hand it to Hall; if he pulls this off, it could be very lucrative for him personally. Let’s think this through. What’s Hall going to do with distressed mortgages? Service them? Like hell. Foreclose? Nope. He’s going to flog them on to a fund at a profit. AIB will have “clean hands” and Hall makes a profit, at the expense of the taxpayer. If you can get past the fact Hall stands to profit from this scheme, it may have some wider merit, if (and it’s a big if!) it is arranged sensibly rather than just kicking the can en masse into David Hall’s lap. I would like to see David Hall acquire only the real genuine hard luck cases - ie. low income, those who would qualify for social housing, living in lower value properties, cases who realistically might be homeless if repossessed - and then work his magic to ensure these people stay in their homes, arguing that the alternative will cost the state more. The rest of the arrears cases: the jumbo mortgages, trophy homes, strategic defaulters etc could then be sold to ultra aggressive vulture funds who are free to do whatever takes to get their pound of flesh, and repossess as rapidly as possible if needs be. The PR problem is solved because realistically how much sympathy is out there for Brian O’Donnell and his ilk? New Beginning - which I understand Hall has no involvement any more with - has a similar model. There was already publicity about them sharing their customer details with an overseas fund. A pig farmer who told two repossession men to strip naked and get into a pen with an agitated boar has been sent to jail following an unsuccessful appeal against conviction. On the day in question, Mr Mulvey and Mr Tighe arrived in a truck with a view to taking possession of the property or securing payment. Mr Justice Birmingham said it was not really disputed that the two men were threatened in a very aggressive manner and told “their heads would be ripped off”. They were told to get on their knees and pray, which they did, and they were ordered to strip naked. Ha ha threatening to murder someone is funny! Interesting post by Jim Stafford over on AAM about a Vulture fund and a bank cutting a deal to ‘save’ a family home worth 900k. Debtor owed €443k to the bank and €8.3m to the vulture fund. Debtor (himself only, wife maybe had her own income etc) had roughly 5k month income (€3,111 above reasonable living expenses). Thats 5k after tax. Spouse had ‘limited savings of her own’ but was prepared to offer up to €80k of that savings towards any settlement. I guess ‘limited’ means different things to different people! The Debtor kept the €900k house in full with no charge against it. And there was no charge against his future income of currently €5k per month net. I read that one also. They managed to convince both the bank and the vulture fund that they would get more by accepting a fairly paltry settlement than by pursuing a judgement mortgage on the family home. They were relying on the fact that no Irish judge is going to allow the sale of the “de family home”, despite the fact in this case that the hubbies share was €450k, and that the wife’s half would have been enough to buy something else to downsize into. It would also have been open to the creditors to pursue payments from the debtor’s income for five years after the DSA, but I presume that by finding sufficient funds in the wife’s “meagre savings” they were able to convince the debtors not to do this. All in all, yer man has a pretty handsome income and they get to keep an almost million quid house, debt free. You could argue the creditors got as much as they were ever going to. You could also say that Jim Stafford – in spite of distancing himself from the original statement – has been true to his word in keeping people in a home that “befits their standing in society”.